Photo courtesy of Miranda Defuria. 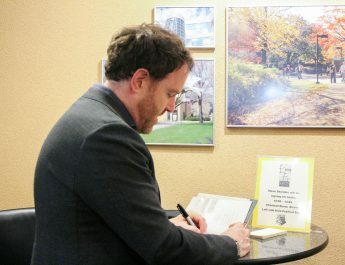 Members of the American Society of Civil Engineers organization at Youngstown State University competed at the Ohio Valley Student Conference — hosted by Cincinnati State University and the University of Cincinnati — in Lawrenceburg, Indiana on March 26-28, placing second in the concrete canoe competition. 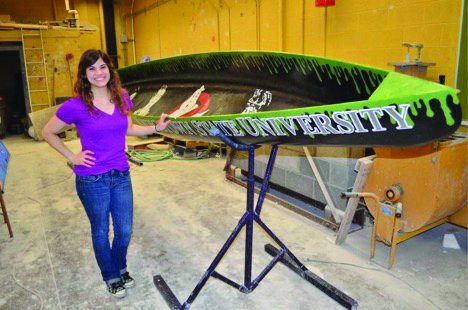 Miranda DeFuria, a sophomore studying mechanical engineering at YSU, is the concrete canoe team captain and vice president of YSU’s chapter of ASCE. “The competition was judged on four parts: the design papers, oral presentation, final product and race competitions,” DeFuria said. 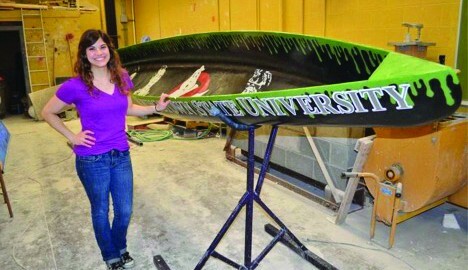 YSU’s concrete canoe was awarded second place overall, also placing second in final product, third place in design papers, third place in men’s and women’s sprints, men’s endurance and co-ed sprint races. Other canoe teams included the University of Akron, University of Cincinnati, University of Louisville, Ohio State University, Ohio University, University of Pittsburgh and Western Kentucky University. The canoe was painted green, baring the faces from the stars of the film “Ghostbusters.” The canoe came in at 20 feet long and 30 inches at its widest point. The canoe was 3/8 of an inch thick and was 13 inches high at its tallest point. The YSU team is advised by Anwarul Islam — chair of the department of civil, environmental and chemical engineering — and is helped by two former team captains, Adam DePizzo and Nathan Knapp. Aside from competing in concrete canoe, the YSU team also participated in a miniature steel bridge competition, but was disqualified after the bridge failed to hold the minimum of 2,500 pounds. The group’s bridge collapsed at around 2,300 pounds.